Angela VanWiemeersch climbs HMR over open water on Lake Superior. Tim Emmett ice climbing through a steep ice cave, formed on the shores of Lake Superior in Michigan. Karsten Delap climbs "El Lanzon" along the Pictured Rocks National Lakeshore in Munising, Michigan. Raphael Slawinski climbs "Resurrection" along the Pictured Rocks National Lakeshore in Munising, Michigan. Raphael Slawinski climbs "Twin Towers" along the Pictured Rocks National Lakeshore in Munising, Michigan. Adam Dailey ascends 'HMR', just around the corner from Grand Portal Point, at Pictured Rocks National Lakeshore in Michigan. North Face Athlete and Michigan-born climber Sam Elias ascends a sketchy lead on "Fallen Feather," on the frozen shore of Lake Superior. Jon Jugenheimer getting the warmth back in his hands after several hours in sub-zero winds along the lakeshore. 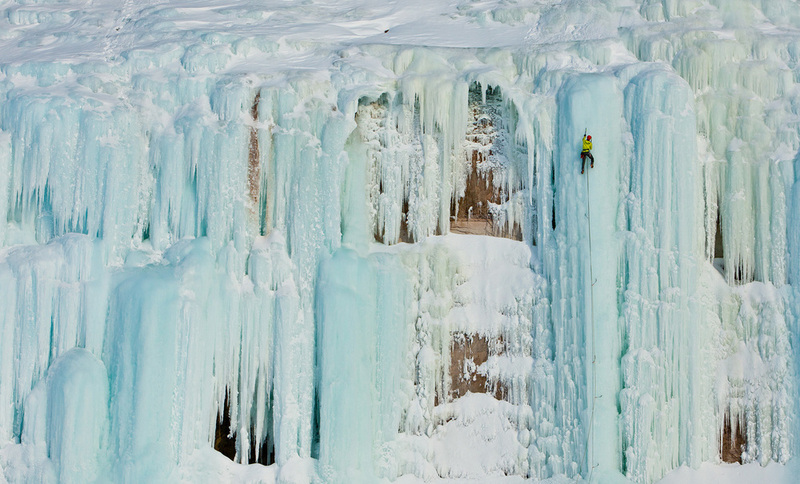 An ice climber rappels down Dairyland over the open water of Lake Superior. 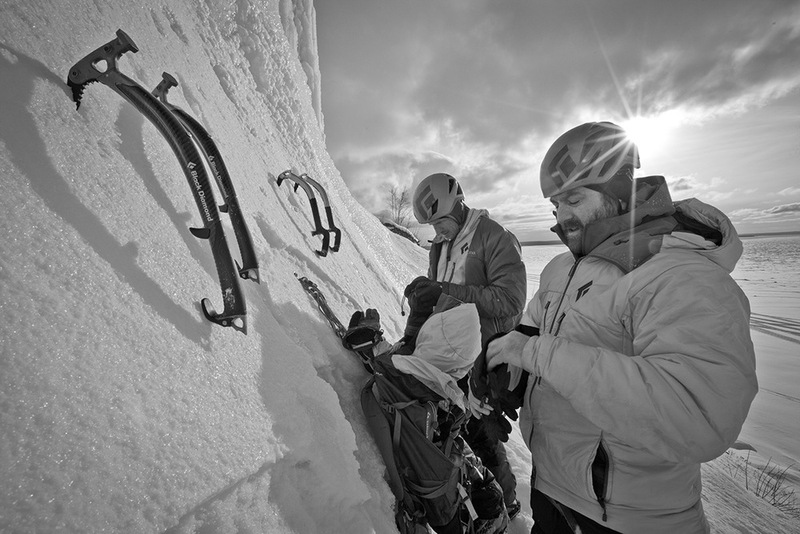 Adam Dailey gears up while Jon Jugenheimer eyes their next route. Adam Dailey leading up one of many vertical blue pillars along the west shore of Grand Island. 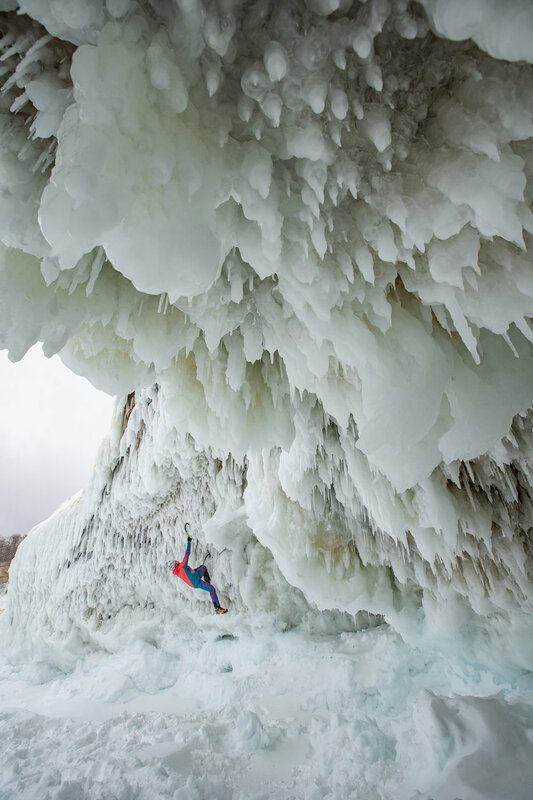 James Loveridge crushing a cold lead climb on Dairyland, an ice climb along Lake Superior. 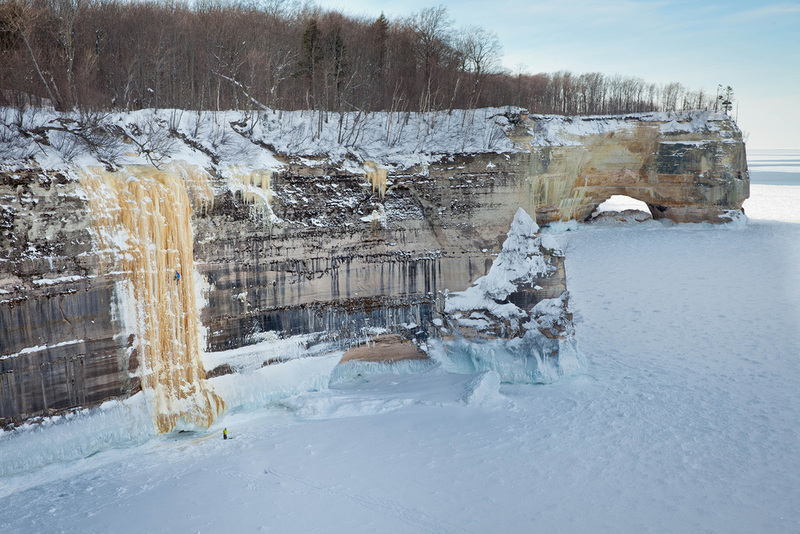 The East Channel ice climbs of Grand Island, Michigan. Jon Jugenheimer coils his icy rope on shelf ice along Grand Island. Local Ice Climbing Guide Nic Dobbs getting on some ice boulders on Mosquito Beach. Sunset on the Mosquito Beach ice boulders. Cold winds and hot breath can form ice in unexpected places. Ben Erdmann following on Twin Towers, with snow covered pancake ice below him. Adam Dailey makes his way up the western shore climbs of Grand Island. The classic UP ice pillar, The Dryer Hose. Adam Dailey and Jon Jugenheimer at the foot of an aesthetic climb on Grand Island. Adam Dailey and Jon Jugenheimer take a rest at Chapel Beach after skiing several miles through the woods of Pictured Rocks National Lakeshore. Joe Priebe has his pick of routes on the immense surface of Giddy Up. Blue ice formations span nearly half of a mile along the western shore of Grand Island.